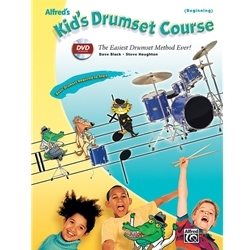 Alfred’s Kid’s Drumset Course is a fun method that allows you to play songs on the drumset right away. The book provides drum models, coordination and drum fill exercises, rudiments and performance tips. The DVD takes you step-by-step through all the fundamental concepts and includes many of the examples and all of the songs.